Happy Thanksgiving to one and all – a quiet one this year but after a busy fall, it’s welcome. There’s been much disturbance in my force – either by my own hand, by actual travel or just changes. Hasn’t been my month to shine. I know… 50% of the people that read this space, you’re all unsettled and moving constantly around the globe, either really good at that or maybe new & learning your way, but in any event, possibly better at all than this gal and you’re just trying to find a place to sleep tonight, not really focused on shining, more surviving or just eating yak cheese & not thinking about the plan at all. Before, I move on – just so we’re clear… as referenced again and again = the other 50% are my family and the five / six friends I am willing to share that this space exists at all but here goes. Been working on writing this all out for a number of weeks…. because sometimes on the least planned, least expected journey, something that speaks to the greater path we’re all on happens and the heavens (or whatever you want to believe in) open up for a glimpse into something greater than this life. It’s going to be long, I am going to digress and it’s going to be clumsy. What a dramatic opener, right? Maybe that’s why it’s taken me so long to consider how to get this all out of my head and out here. A long long time ago, I was child and my parents liked museums – liked is trite = my parents loved museums. My father was an Art Historian (I am capitalizing that because he was an ART HISTORIAN and frightening in his vast and endless knowledge of art), the greatest art historian I’ll ever know and my mother is/was an artist and well, no slouch herself. They met later in life so they had had time to really make art their own and for their children, well, art was never something one could opt out of – it was everywhere. Books filled the house, conversations were centered on big topics and every vacation or trip anywhere, well, museums were part of it – and not the fun ones like Air & Space or maybe Natural History… no, I am speaking of the world’s warehouses of culture. At the ripe old age of nine, I had spent as many hours in one day in the Louvre in Paris and then the next week at the Victoria and Albert in London. I knew the many benches of all intimately and grumpily. The good news is memory is alive and the prism of time changes our view back… through osmosis, most of it was indeed getting in there, without realizing it at all. My father was a great story teller and he knew how to sell art to the hardest audience – the under ten ones included. He brilliantly told all the scandals, the tragedies, the fame and then the falls – the falls were the best part. In other words, he told you the real deal. He didn’t clean it up – my sister and I got it all – no edits for the young and maybe that’s where my love of story telling was born. Art was just a way to access it… we’ll get back to that in a bit. You’re asking why this post is labeled Washington DC? It’s coming. My cow life is one of demands – not on purpose – but when I am here, I am responsible, I run a real grown up life, filled with work and people. Needing things. Time. Me. Sometimes, I just want out. I’ve said that before that’s why I travel – sure, that’s part of it. We all want escape. Adventure. Even addicted to that some days. A study in contrasts, sometimes my cow life comforts me in it’s sameness, it’s guaranteed experiences. Lately, that’s not been so and as I just used up my big adventure card in Nepal, a weekend jaunt was all I had in my pocket. Of course I like to muddy the waters and combined it with other reasons, always a bit of work, to see old friends but when the universe has another plan, there’s no stopping it. And there was another plan. Back to the art. All this osmosis and experiences… the tragedy was it never felt like it was mine. I could pretend now to all my smarty pants intellectual friends that I loved it. I won’t here. I didn’t. It was torture as a child – I’ll confess. Only once, was I successful and had a spectacular tantrum, all to see the white tigers at the Washington Zoo. It was cold and grey and the tigers were asleep. There’s a message there. As the years went by, even so, I kept going to museums. I can’t stop now. I followed my parents, my sister, I followed friends and other family who clearly loved it more than me and after a fashion, I stopped really looking at the art (my father just passed out in heaven – stay with me, father!). Somewhere between recognizing the genius – I am not bananas – (he just revived a bit up there) and still being that bored kid on the bench. That’s how my museum going had progressed. I don’t think I could have ever admitted that before because, well, it’s blasphemous to my people. Fifteen years ago, the greatest art historian I’ll ever know died. He took with him all those stories and all that knowledge. I don’t mean to discount my mother who has proven a true match to her late husband in different ways, but he was, well, epic and his mind was, well, better than most. Art, while still not my own deal, as fundamentally his, at least I could visit all the paintings we visited when I was a child like dear old friends. Don’t believe in ghosts (well, I do and I don’t but I want nothing proven yes or no), but I do believe in energy of souls who have moved on and I swear there’s a bit of Dad in the many museums of the world. Back to DC, I told you I’d digress. My weekend plans had unraveled. I unraveled a bit at my plans unraveling. I needed a solo weekend and the fates knew it. Quiet my mind somehow. Work out this restlessness. A dear and lovely friend rearranged her schedule to have dinner with me on Friday when I arrived. When she asked what I was going to do the next day, I said go to the National Gallery of Art, one of the culture warehouses of old, as I had not been there in a long time. What I didn’t say or or know, I was disappointed. Life was thwarting me. I thought wanted to spend some time alone but what I really wanted was some portal to a simpler time and my noisy mind thought that could be solved at the church of my family, an art museum. I wanted a time machine. I missed my father. I missed being a child and being taught how to see art, I wanted no demands, just to be lead here and there and told things. After a not great sleep at a nice hotel, the next day dawned. Freezing, sunny in a sort of haha looks twenty degrees warmer than it is, I was grumpy as I walked through the Saturday morning streets of DC. Maybe a small part of me was nine year old art grumpy, mostly 43 year old woman grumpy. Museum goers know the rustling hush of the entrance of all houses of art, the footsteps of many, with their maps and their plans of what to see. I walked in that morning and realized, %^&. I was there but what to see? Where were the favorites? My heart sunk to my feet and the missing, the loneliness of not having Dad there to direct me, to march me on, to inform me of what I should see, took me down. I heard the crack of my heart. Bitter beyond reason, that all those visits, those lessons, those lectures not remembered, seemed gone forever. And I cried. You can all re-read my other posts. I am not afraid of tears. I had a coffee (my Cuban love of coffee) and well, no one is here to tell you what to see and you’re going to just have to look like you maybe have never ever looked before and maybe it will work out. The art is going to just have to stand up on it own. Now, in that blurry time, I am not sure I got all of that but certainly some of it and something magical, maybe even mystical happened. Yes to that, no to those and for the next two hours, I just looked and looked and looked. Recognized the art of old and in a clearer head, the stories and connections came back because Dad was a great storyteller and I have a very small piece of his great mind (small). I made new favorites, said goodbye to some old duds, all with a guiding hand – maybe my father’s energy, definitely his facts, maybe something greater but in my near middle age, art was finally mine – 100% mine. The stories, thank goodness, were even better with my new eyes – brighter, more colorful, they lived. Humanity never lets me down. Never will. And apparently neither will art, a glimpse into the divine in all of us and beyond this life. My father told me stories about pictures. People tell me the stories about the pictures of their lives. The reason why any of it stayed with me at all are the connections – art, people, places, music, things – all of those strands of this world woven together. My everyday friends will tell you, you tell me your backstory, I can forgive and feel compassion for a multitude of sins, I’ll join you in celebrating every single one of your successes, I’ll cry your tears and hold your hand, I’ll laugh with, maybe at you – I’m imperfect. I work in the field I do, I travel, I meet people because I will never be done collecting the stories, our connections, the human experience that links us all. I just have been missing how it all fit with art and how I fit with that. That cold day in DC, I felt closer to getting it and as the weeks have gone by, it’s sorting out in my mind. …And then I went into the Museum of the American Indian and heard a group of veterans sing hymns. Moving other worldly hymns to the beat of the drum, synced with my heart and so ended a morning that didn’t start out that well. The plan. Sometimes, you just have to let it unfold. My own thanksgiving. Thanks Dad, thanks artists of old and new, thanks to the storytellers, thanks to the divine in unraveling to knit it all back together again. My restless unquiet mind hushed and my heart stepped in to really listen, my eyes opened to really see. Saw many a t-shirt throughout my time in Nepal: a little up, a little down, little seems an understatement considering men and a few very intrepid women have trekked to the top of this mystical magical Himalaya mountain time and time again to seek the top – something like 4,000 success stories, hundreds & hundreds of tragedies. While in Kathmandu, I was able to hear Maya Sherpa (she is a female sherpa to summit Everest and a number of other peaks & this past spring the 1st Nepalese Women K2 Expedition 2014: Women Climb for Climate Change). Climbing is in her blood, spiritually, emotionally and undeniably part of her culture and as a woman, she spoke of always wanting to climb, being driven from childhood to seek the top of the world despite being born a girl. Her story is one of someone who never accepted the limitations of her gender and persevered. Climbing today with oxygen canisters and “ice fall” doctors setting up ladders and safety line may be much easier than the expeditions of Sir Edmund Hillary and others, but the word easy is a crazy kind of understatement. How did I summit Everest? Well, of course, I didn’t and very likely, I won’t ever get closer but endless respect in baffled awe those that do, did and will someday. 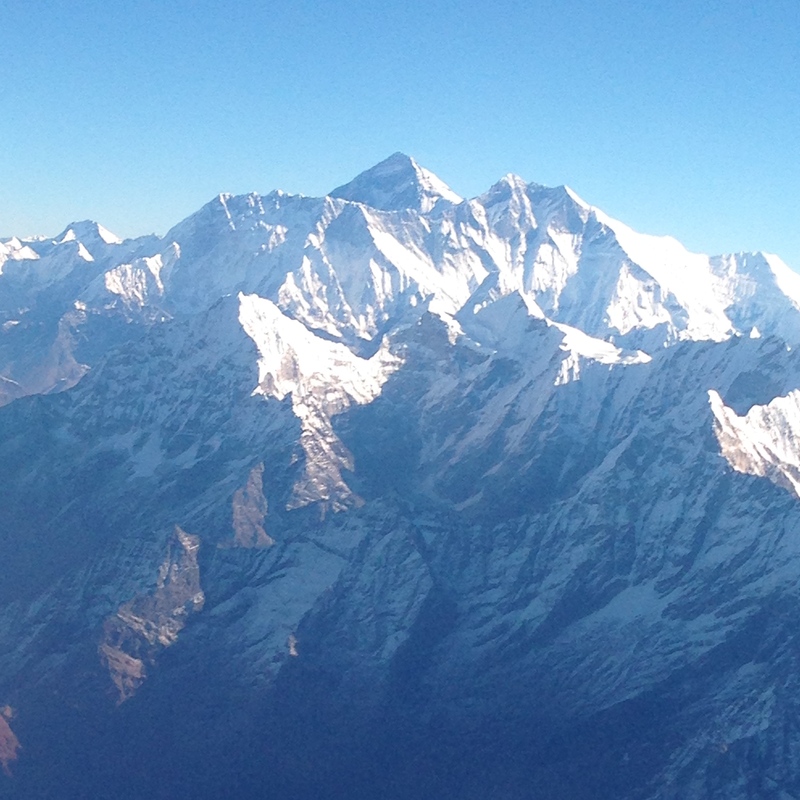 All I did was take the touristy Everest flight on Yeti Airlines when in Kathmandu which was odd, quirkily funny, earnest and satisfied my needs, albeit at a safe and oxygen filled distance. Looking at the snowy peaks from an airplane, Everest or Sagarmatha / Chomolungma is tucked behind the others a bit, the iconic peak slightly harder to see but then you do and from the Nepal side, the mountain looks forbidding, terribly cold and GIANT, the triangle top above all the others. There you are, I thought – the mountain, challenged and claimed so many lives. Of course, we all have our own Everests. That time, that thing, that dream we cannot give up, that drives us up and up again, that suffocates us with lack of “oxygen”, that we pursue despite every single thing in our lives telling us to give up the dream, stay home, take the easier choice, hide, choose the smaller dream because the big one just might do us in, but we climb anyway, we cannot stop and all of us, united in dreaming and yearning, striving, may we be blessed with good conditions, clear skies and hopefully we all summit the peaks – a little down, a little up – now I get it.